Ginger tea with lemon stimulates the digestive tract, removes toxins from the body, affects the performance and health of the digestive system, restores appetite, reduces bloating, helps with allergies, stimulates circulation, strengthens the immune system and restores balance to the body. The changing weather causes development of many diseases, especially colds. Fortunately, there are simple, natural ways to prevent colds as well as to improve our health. 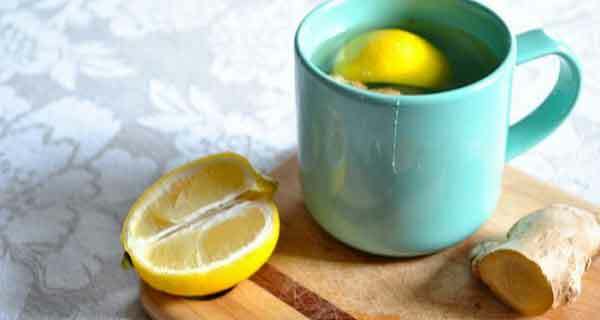 One such ritual is drinking a cup of the powerful and popular Ayurvedic tea –a mix of lemon and ginger. Some ancient Ayurvedic texts advise drinking several cups of this tea a day. Despite that, we won’t give you the same advice because the amount of drinking depends on one’s needs. Start off your day trying this drink and let it grow into a very healthy habit. This tea’s strong flavors will boost your energy and stimulate circulation. Lemon has extraordinary effects on the stimulation of the salivary glands and assists in the health of the intestines. Grate a large piece of ginger and squeeze its juice into a cup of tea (about 1 teaspoon of squeezed juice) using your fingers. Slice or grate the ginger in a pot filled with water, add the lemon juice and boil. After they are boiled, cover the bowl and let it stand for 5 minutes. Strain the mixture, and then sweeten it with honey. The ginger lemon tea helps the digestive system do its job and it is very efficient in the elimination of toxins. It stimulates the functioning of the digestive tract. One of its biggest actions is anulomana (action against flatulence) and restoring the proper flow of body fluids that work to reduce indigestion and restore a sense of comfort in the stomach. This beverage is very effective in treating flatulence and restoring the proper flow of body fluids that can help in reducing indigestion and bring a sense of comfort in the stomach. Due to its healing properties, this tea is recommended for people with impaired circulation, people having difficulties with their respiratory system, or people who suffer from increased mucus production and a feeling of heaviness in their chest.